PES and TVA have teamed up to provide tips that will help you save money on your electric bill. Nobody wants to get an unexpectedly high electric bill in the middle of the winter or summer. At PES and TVA we know that there are areas of unnecessary usage or small upgrades to insulation caulking windows and doors and re-striping around door openings that end up saving big money. Many of these changes are easy for homeowners to do on their own without professional help. Sometimes, the savings will come when you are faced with buying a new heating unit, water heater or large kitchen appliance. PES and TVA encourage you to take your own energy audit and then review these resources to help identify the areas where you can save. Decisions you make about the materials for insulation, what to look for in doors and windows, how/whether you insulate your attic, walls and crawl spaces and even the types of appliances your select can help save money each and every month on your electric bills. Even small things can add up quickly. Families who work together to make sure that lights are turned off when you leave the room, televisions and computers are shut down when you are finished with your projects and keeping doors and windows closed so you are not heating or air conditioning the outdoors can go a long way toward saving real money each and every month. In addition, PES has partnered with SmartHUB so that you can watch and manage your electric usage. All you have to do is download the PES SmartHUB application on your smart phone in order to help you stay on top of places where your lifestyle or use of electricity can be managed to prevent big bills from usage that you don’t really need or want. In real time, the application watches your electric power usage and can help you identify times of day or night and even the ways in which your home is using electricity. This tool lets you stay in control of managing usage to help avoid a surprisingly high bill. 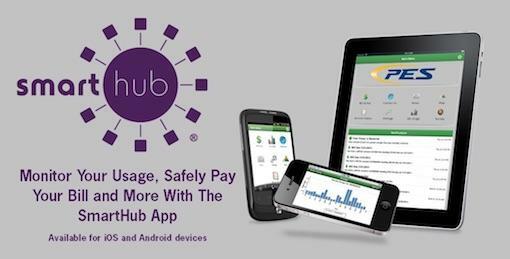 Keep Track of your actual energy use by downloading theSmartHub® App to your Smart Phone or computer. These links allow you to download .pdf documents with useful tips to help you save energy and money. Q. How well is my home insulated? A. If you can see your ceiling joists, you need to increase the amount of insulation in your attic. Attic insulation should have at least an R-30 rating. Q. How tight are my windows? Are they single pane? A. Single pane windows should be replaced with double pane, Low E windows with a U value between .30 & .39. Q. How efficient is my central heat & air conditioning unit? A. Units that are 10-15 years old aren’t very energy efficient. In the cooling mode, energy efficiency is based on the unit’s SEER or EER. Anything greater than 10 is good, 12 is better. As of January 2006, the minimum requirement is a SEER 13. In the heating mode, look for the HSPF for heat pumps or COPS for geothermal systems. The higher the number, the more you will save. Q. Am I throwing money out the window? Summer – Heat from the sun through your windows adds to the cooling load of your home. Close drapes in East/West facing windows to block out high heat. Winter – The sun sits lower in the sky during winter months. Heat gained through South facing windows is an advantage to warming your home. Windows that don’t receive sunlight will lose heat unless drapes are closed. • Set your thermostat at 78 degrees or higher in the summer and 68 degrees or lower in the winter. • Get your heating and air conditioning unit serviced every year. • Clean or replace air filters monthly. • Invest in a programmable thermostat. • Use a ceiling fan to circulate air down in the summer months. • Find out how much energy the appliances in your home use with our online Appliance Calculator. It can add up to about 20% of your total consumption. • Take the dollar bill test. Close your refrigerator door on a dollar bill and then try to pull it out. If the dollar comes out easily you may need new seals or a new refrigerator. • Plan what you need inside the refrigerator before you open the door. • Set your fridge at 40 degrees. • Let food cool before putting it in the refrigerator. Hot foods will raise the temperature in the fridge and make it work harder. • Consider cooking outside on a grill during summer months. Using an oven makes your home hotter. • Wash full loads of clothes and use cold water when possible. • Don’t overload the dryer. • Clean the dryer lint filter before each load. • Don’t run the dishwasher unless it’s completely full. • Use energy-efficient Compact Fluorescents (CFL). They cost more to purchase, but use one-quarter as much energy as incandescent bulbs and last up to 10 times longer. Calculate your savings with our Light Switch Calculator. • Keep light fixtures and bulbs clean. Dust absorbs 50% of light. • Turn off any unused lights. • Seal up leaks by weather-stripping doors and caulking windows. • Close the fireplace damper when you aren’t using it. • If your water heater is in an unheated space, wrap it in an insulation blanket to prevent it from losing heat. • Turn the water heater off if you are going to be gone more than three days. • Use less hot water by installing low flow showerheads. • Repair leaky faucets. A drip can waste up to 48 gallons of water in one week. PES Energize and TVA are making it easier than ever to become energy efficient while also saving money. 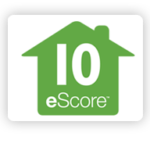 With the In-Home Energy Evaluation Program, you can reduce your power usage and receive a cash incentive or financing assistance for installing home energy improvements. The recommended energy-related home improvements you make are eligible for reimbursement of 50 percent of the installation cost, with an upper limit of $500, or for convenient financing. Call PES Energize or Conservation Services Group (CSG) at 1-866-441-1430. to schedule an audit with a TVA-certified evaluator. PES Energize charges a $150 in-home evaluation fee. If the home owner makes recommended improvements this fee will be reimbursed. After your home is evaluated, a report is created outlining the potential energy-efficiency modifications and available cash incentives or financing (if applicable). To ensure work is completed to TVA’s standards, modifications must be made by a member of the TVA Quality Contractor Network, except for self-installed measures (as allowed by your local power company). The evaluator will provide the names of qualified contractors. All home modifications must be completed within 90 days. Once the work is finished, it will be inspected to ensure that everything is installed properly to maximize savings. After the inspection, you submit receipts for the completed work to be eligible for the cash incentive. For financing, your contractor will be paid directly upon successful completion of the inspection. No matter how many modifications are made, $500 is the maximum reimbursable amount for all approved work completed. Some modifications have lower maximum amounts, and some require PES Energize pre-approval. Energy Finance Solutions (EFS) financing, with repayment is directly to EFS. For more information on the In-Home Energy Evaluation Program, contact PES Energize at 931-363-2522. PES Energize in partnership with TVA is pleased to be part of the Green Power Switch, encouraging residential and commercial ratepayers to take part in the movement to develop efficient ways to deliver your electrical power needs from the energy of the Sun and the Wind. Developing the technologies to unlock the energy potential of the Wind and Sun create a clean and renewable electric supply source for all of us. Harnessing these power sources requires investment from homeowners and businesses throughout the Tennessee Valley. TVA and PES Energize are working cooperatively to bring renewable resources such as solar, wind and even methane gas to the Tennessee Valley and to each of us in Giles County through the Green Power Switch. The Green Power Switch is a program that enables residential and commercial customers to purchase power blocks from these innovative sources, substituting percentages of your home or business’ monthly consumption from nuclear driven plants, oil, gasoline and natural gas sources to the limitless opportunities that exist as we learn to harness the power of the sun and wind. As a ratepayer in the PES Energize system, you can decide what percentage of your power use you want to substitute with renewable sources. The smallest amount would substitute 12% of your usage, but most commonly ratepayers will choose to substitute about 25% of their usage. This has the impact of saving 246 gallons of gasoline each year or planting 2 acres of forest land each year. Every block you substitute accounts for about 12% of your usage and adds about $4.00 to your home’s electric bill. Business and Industry partners, often participating so that they can advertise their leadership role and commitment to clean and renewable energy, will purchase blocks based on their actual usage. Each block purchased – whether by a residential or commercial customer, decreases our reliance on nuclear energy, coal, oil and natural gas. Together, we can move toward cleaner and environmental safer alternatives to producing the electricity we all need. Green Power Switch is sold to residential consumers in 150-kilowatt-hour blocks (about 12 percent of a typical household’s monthly energy use). Each block adds $4 to the customer’s monthly power bills. Consumers may buy as many blocks as they like. In other parts of the country, residential consumers who participate in green power programs pay an extra $2 to $10 per month for green power. Green Power Switch is also marketed to commercial and industrial consumers, who are asked to buy blocks based on the amount of energy they use. How does green power benefit the environment? The environmental effects of traditional energy sources like coal, natural gas, oil, and nuclear power can be significant. Although no source of energy is impact-free, renewable resources create less waste and pollution. In fact, an investment of an additional $8 per month on your power bill buys enough Green Power Switch to equal the environmental benefits of planting an acre of trees in the Tennessee Valley. Although renewable sources like sunlight and wind are free, the technology used to capture the energy they produce is still more expensive than traditional power generation methods. However, increased demand may lead to expanded power production capacity and eventually to lower costs. How much electricity does Green Power Switch produce? How many consumers does Green Power Switch serve? Green Power Switch can provide enough electricity to supply one block, which equals 150 kWh, a month for about 54,000 Tennessee Valley homes, plus an ample supply of energy for participating businesses and industries. You can Sign Up Online!